The success of this desk was fueled by two things: 1) a good vision and implementation on the part of the builder and 2) a strong working relationship with our projects team. 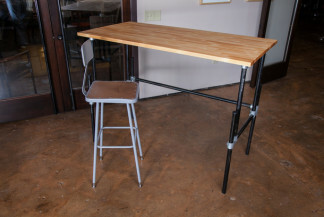 Our projects team actually put together some elements of this desk in our warehouse to see if the configuration would work before shipping the components to our customer. 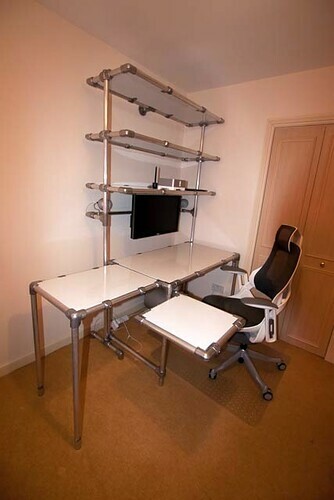 This desk has several features that make it totally unique. 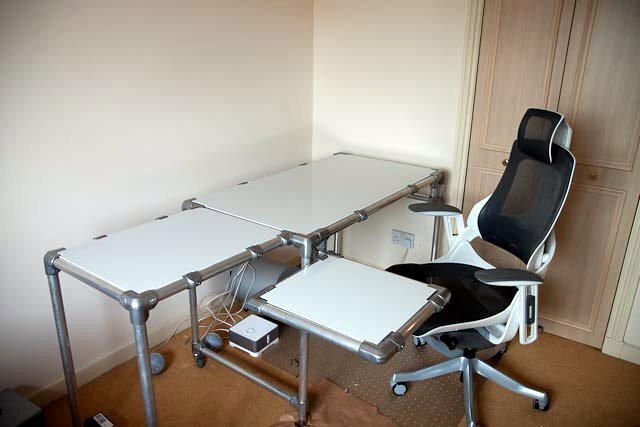 The obvious feature of this desk are the swing-out and fold-out sections on the side of the desk. 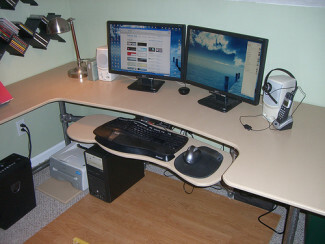 The fold-out portion on the side of the desk is fairly straight forward. 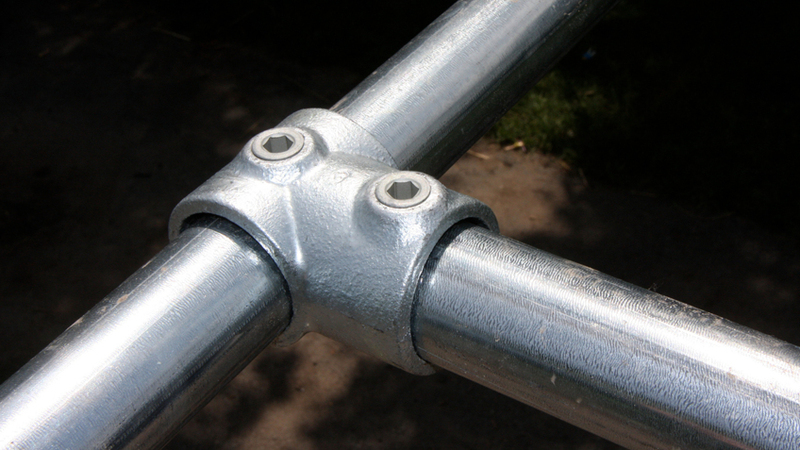 Standard L10 Tees are used as a hinge. 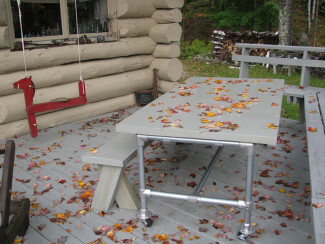 When the side desk is lifted up, it is then supported by legs that are place into the L20 Side Outlet Elbows (these are put in place by hand). The swing-out is very unique. 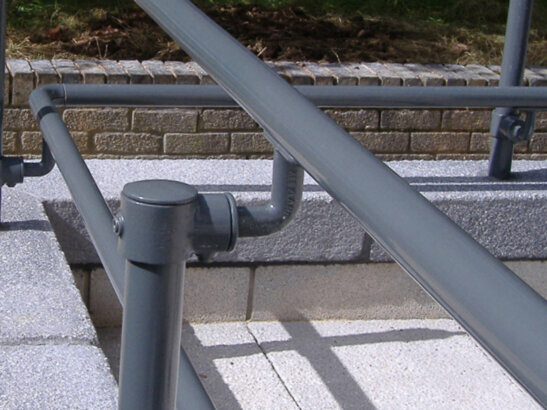 The hinge is formed by an L46 Combination Socket Tee and Crossover fitting. 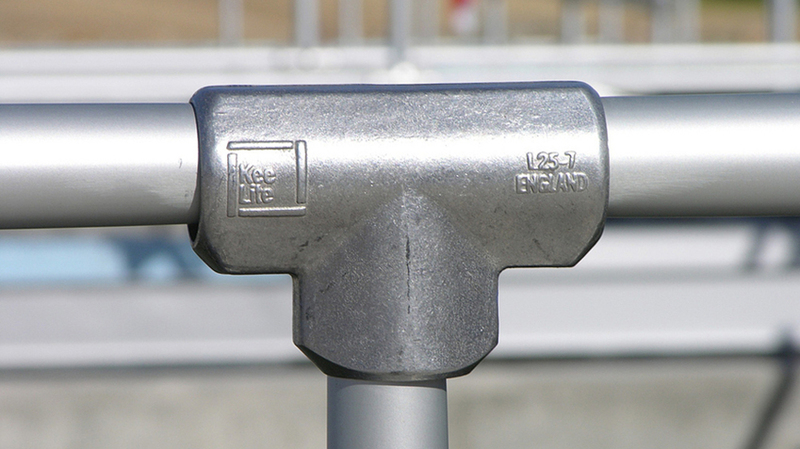 This fitting swings on a pipe that is secured between two L10 Tees (one above and one below). L15 Elbows form the corners of the swing-out. 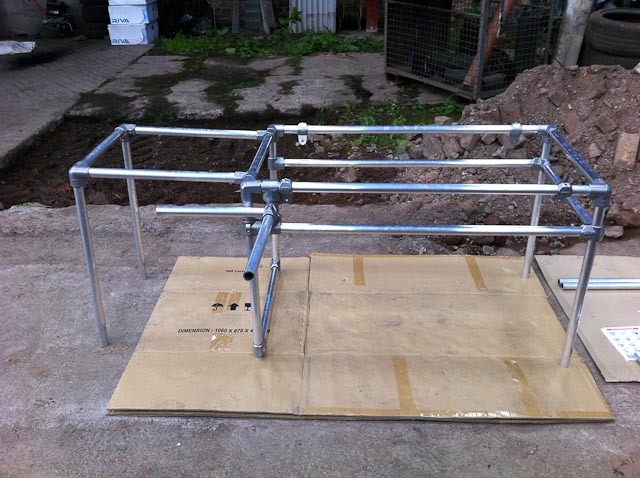 Check out the pre-construction picture below to get an idea of how all the pipe fitting go together on the pipe frame. 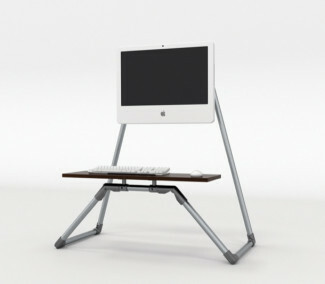 The desktop and the tops for the swing-out and fold-out desks are attached to tabbed fittings called LM50s. 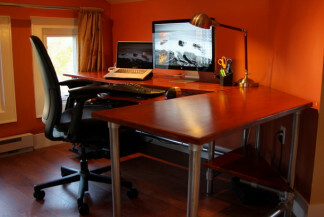 Another unique feature of this desk is that the shelving unit was constructed separately. 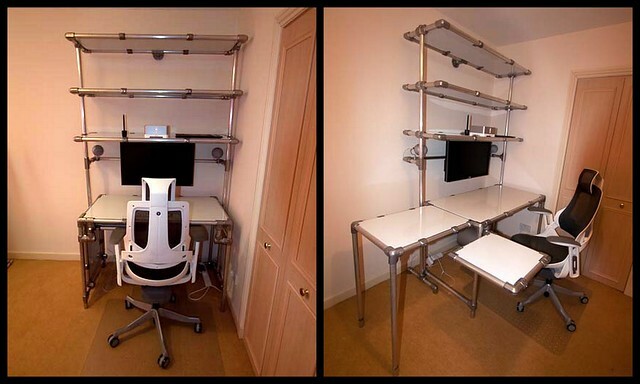 This allows the desk to be utilized with or without the shelving unit. 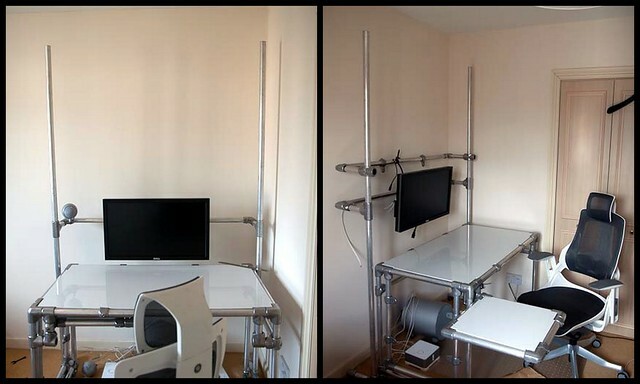 The shelving unit has an integrated bar to support a flat screen monitor with a pipe mount. The remaining shelves are attach to the upright pipe with L26 Two Socket Crosses. 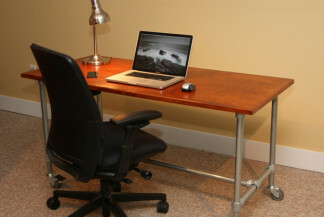 And use the same elbows and support tabs as the other sections of the desk. 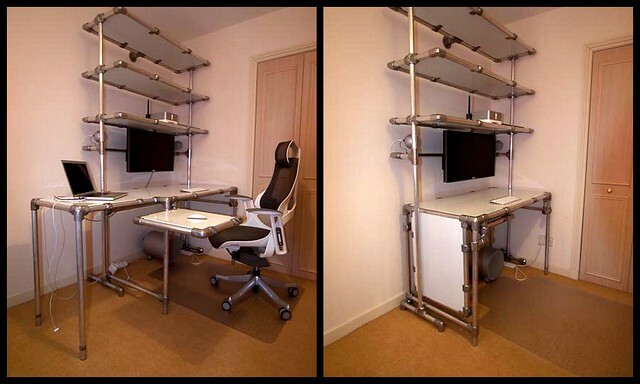 OK, we know you want a desk like this, but here's the thing: you've got to build it! 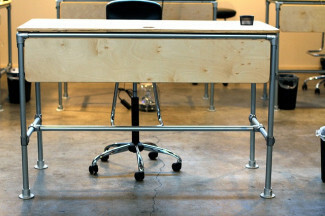 Our projects team is here to help you design and select the Kee Klamp and Kee Lite pipe fittings you need to build your desk. But the implementation is up to you. Call or email us today with your questions and ideas.